Head coach Gregor Townsend expects a tough derby encounter with Edinburgh as Glasgow Warriors target a home tie in the Rabo Pro12 play-offs. Friday's 27-9 triumph over Ulster at Scotstoun was a fifth successive win for Townsend's men. "This is the biggest fixture on our calendar," said Townsend. "It's vital as we push for that home semi final." Third-placed Glasgow are a point above Munster and one behind Ulster in the Pro12 table. "In recent history, no team has won an away semi-final, so it does help," added Townsend. "We felt we played our best game of the season last year in the semi-final away to Leinster, and we lost by two points, so it would certainly help. "If Munster get the bonus point against Connacht, they would be four points above us and we'll have a game in hand over them. "So winning our three games might not be enough. "We'll probably need to pick up bonus points in two of the three games. But, if we did win those three games, it would put us in a pretty good position to get a home semi." Edinburgh's visit to Scotstoun next Saturday is a rescheduled fixture following the postponement of the traditional 1 January meeting. Warriors were 20-16 winners at Murrayfield on Boxing Day and the 1872 Cup - presented to the aggregate winner - is also up for grabs. "Edinburgh were the better team against us at Christmas and they will be really up for the game," added Townsend. 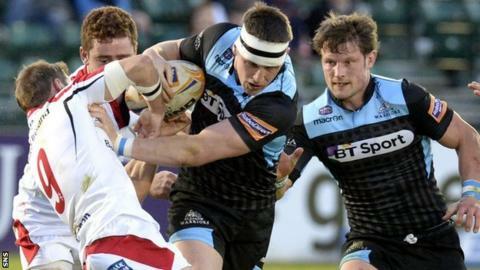 Glasgow's victory over last year's beaten finalists, Ulster, followed an away win in Munster. "The final 50 minutes were top drawer," added Townsend. "It took a while to get going - we just stood off them a bit in the first half. "That was maybe giving the opposition a bit too much respect. "The yellow card really was a catalyst. Suddenly, we realised we had to defend well and be smart. "The victory was built on tackles in defence and there were also some really good decisions in attack."